It’s fair to say that Chowaha is not a widely played variant of poker but it can offer an interesting diversion from the standard community card game. It’s probably more suitable for home games rather than casino play but will suit either. Community card poker involves players sharing one or more face-up cards placed on the table by the dealer. The aim of Chowaha is to create the strongest five card hand according to standard high poker rankings. Chowaha uses blinds as the basis for betting so the players to the left of the dealer will place the small and big blinds respectively. 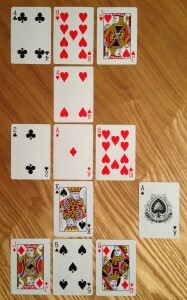 The final card layout is shown in the diagram on the right hand side; the Ace is the river here. A round of betting takes place after the flop, turn and river after which the showdown takes place if more than one player remains in the game. In the example layout shown, selecting the J♥ from the top row means you would also be selecting the 4♥ and the A♠. Selecting from the middle row offers a choice between the two turn cards (4♥ and K♠) plus the A♠. Hands are then compared according to standard high poker rankings.